We know how much everyone loves a bargain and we aim to please. Here you will find all our latest offers, discounts, giveaways and bonuses. These offers will change from time to time, so keep your eye out for all the latest deals! 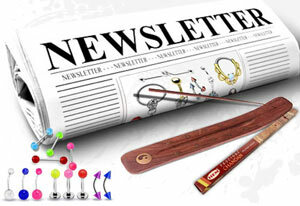 Sign up for our special offers Newsletter and not only will you be the first to be notified of any special offers, discounts and giveaways, you will recieve a FREE piece of Body Jewellery or an Incense Ash Catcher and 10gram pack of Incense! Follow this link to sign up for our newsletter! Simply book your next Ionic Foot Detox and bring a friend for FREE! This two for one deal is available until further notice. You may use this offer as much as you like in the mean time. Please note that due to the detoxification process there is a limit on how many times in a week you are able to detox safely. This is our only restriction on this offer. Please book ahead to ensure we have the timeslot you require available as this is another of our popular services. Our loyalty offer extends to anyone having a body piercing done. Earlobes are not included. With this offer you get every fifth body piercing FREE, even if it is all in the one day! You still get your extra piece of jewellery with our jewellery offer which just piles up the value. Karma House Cairns offers the safest and most cost effective body piercing in Cairns. For a limited time we are offering all our stainless steel jewellery for a maximum of $15. No matter the normal retail price it is yours for our low offer price of $15. You may purchase up to ????five??? pieces in one transaction. Spend $15 or more in one transaction on any of our incense sticks, cones and related products and receive a FREE 10gram pack of incense. Items must be purchased at the same time to be eligible for the free incense pack. Free incense may be any pack of incense from our 10 gram range.